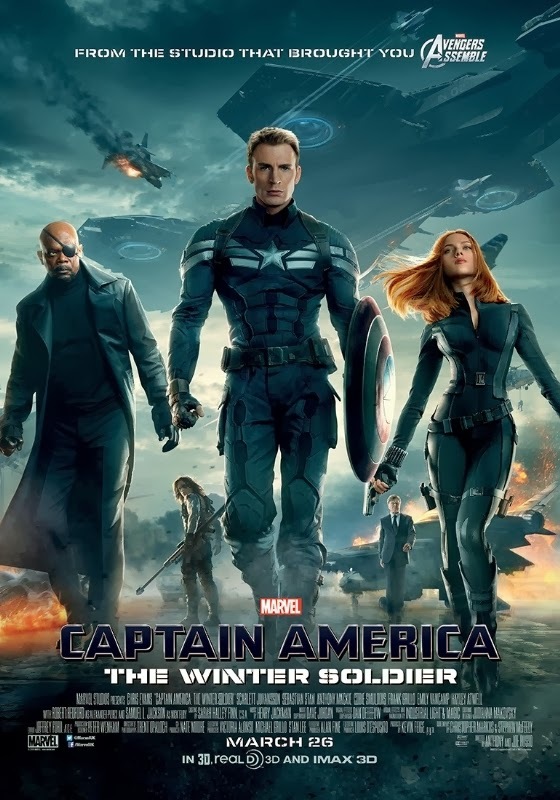 Marvel has released five new Captain America: The Winter Soldier posters, but one character is conspicuously absent. 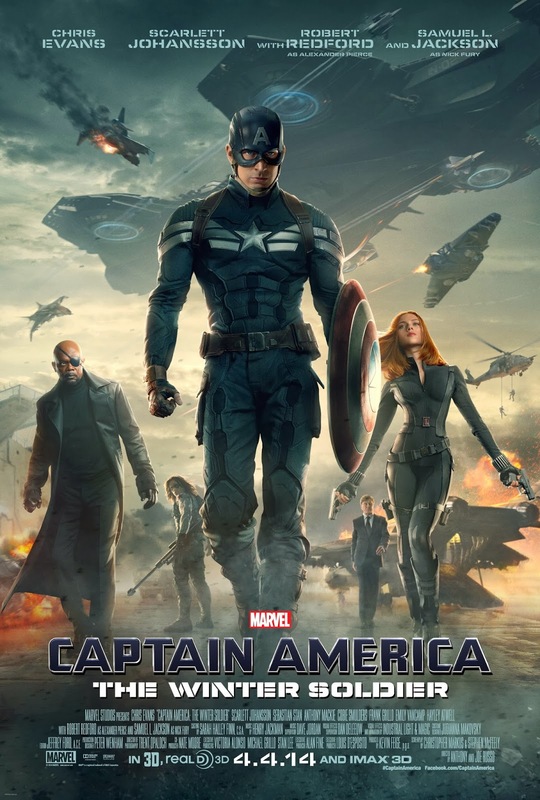 There are six posters in total featuring shots of Captain America/Steve Rogers (Chris Evans), Natasha Romanoff/Black Widow (Scarlett Johansson) and Nick Fury (Samuel L. Jackson). Falcon/Sam Wilson , played by Anthony Mackie, is nowhere to be found. Why? Here are the posters for the film Marvel has released. 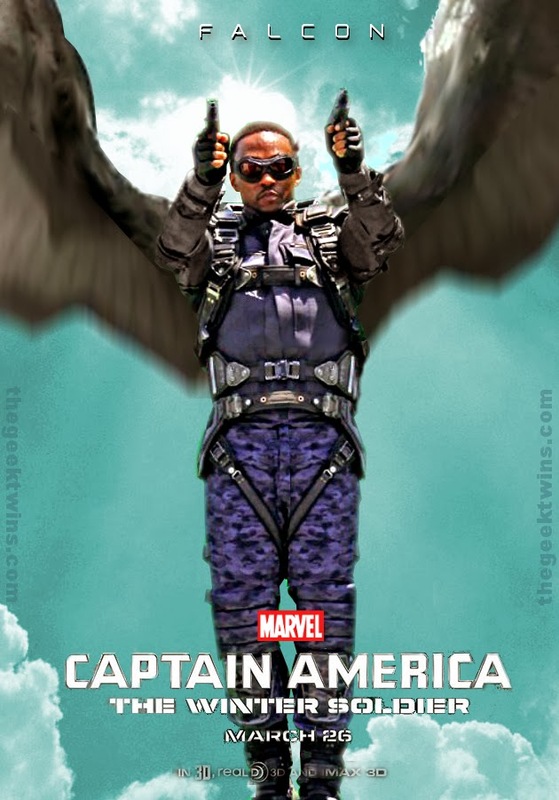 Here's a poster I made to show what a Captain America 2 poster for Falcon would look like. Before you say Falcon's just a supporting actor, then you should check out the credits in the poster. 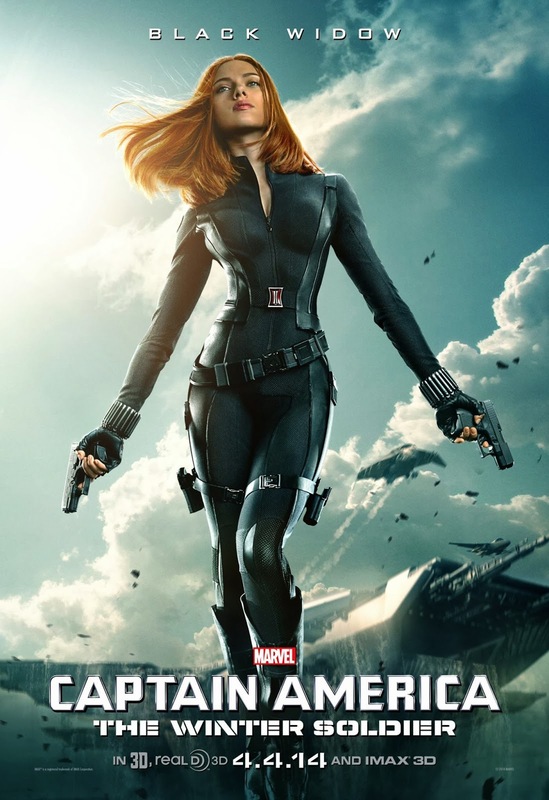 Mackie gets third billing after Scarlett Johansson and Sebastian Stan. So, maybe he doesn't get his own poster, but why isn't he even in the background? He was sold as a "second lead" in the film and he's being treated like a cameo. If you watch the trailers there's another unusual pattern I've noticed. The Super Bowl commercial is full of great images of Falcon, but in all the trailers for the movie he only has two lines. He says, "When do we start?" and "How do we know the good guys from the bad guys? So why doesn't Falcon get a poster? What is Marvel afraid of? 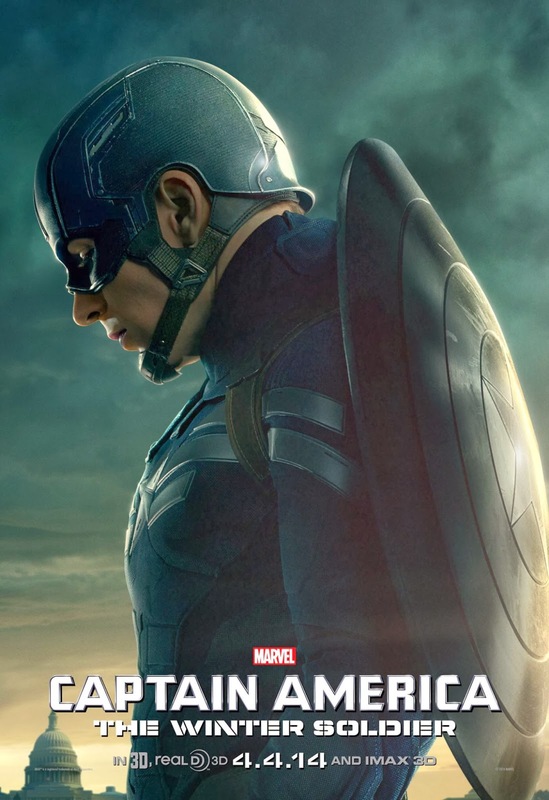 Captain America 2 has a release date of April 4, 2014 (USA). What do you think? Why isn't Anthony Mackie in the posters? Should Falcon get more marketing attention? That's a good question. He should have his own poster. At the very least, he should be in the main one. Great find! I didn't even notice. Pure speculation here: Some have said that someone bites the dust, I thought it would be Redford, maybe it is Falcon. Maybe they just want to keep his wings and stuff more on the down low for now. I wonder, is he going to be able to talk to birds in the movie? He may be a difficult character to sell to general audiences who would have no idea who he is. And rightly so. But I'm sure he'll be a fine part of the movie, especially since he's portrayed by the always excellent Anthony Mackie. There are just too many characters already ripe to represent in the posters, and another major addition (or revision) in the one from the subtitle. Ooo. I hope not David. I would go crazy since the character has a lot of potential. I wonder that myself. If they put it in he could get laughed out, but if they don't the character would be lacking in my mind. When I think about it the 3 they show are characters from The Avengers so they probably want to go with the familiar characters first. 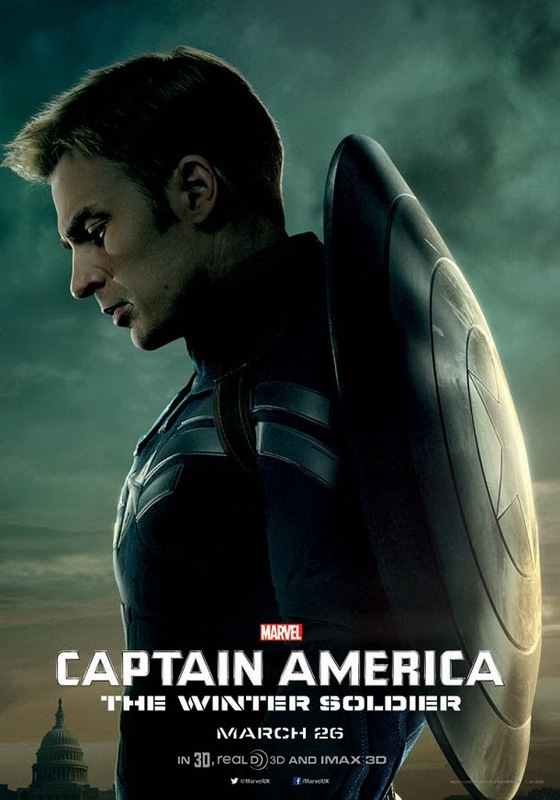 There's also no Winter Soldier poster and he's obviously an important character. Even if they just have a little shadow of him flying around in the background I'd be happy. I think they need him too much for the Age of Ultron movie. I think it's likely that they didn't make a poster of Falcon because he really isn't a draw (yet). 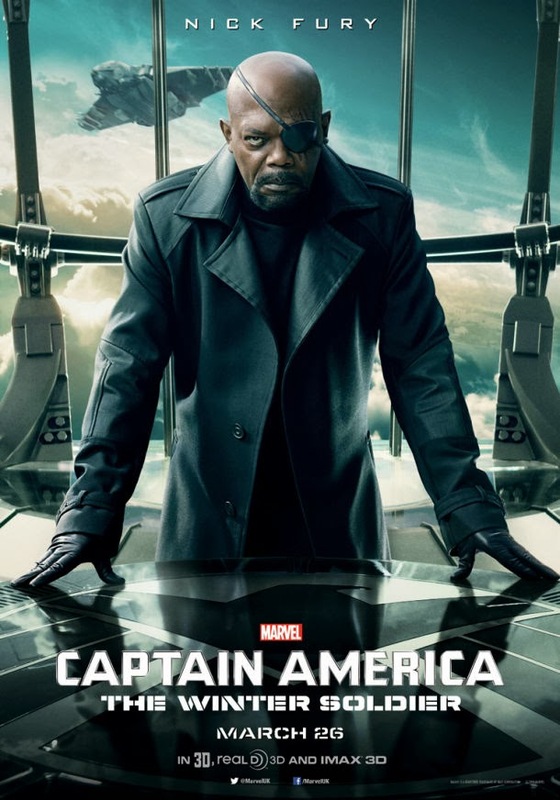 The other characters are established, so it's easy to make up a poster of Nick Fury where you immediately recognize him. Then you say to yourself "Cool, more Nick Fury - I'm IN!" Whereas with Falcon, you don't have the recognition yet. With that said, I'm just surprised they didn't make an "Agent 13" poster. Why pass up the opportunity to put a hot blond on your poster? That is very weird. I can't figure it out at all. I thought I had an idea, but the more I thought of it, it didn't make sense. Your mockup is very good, btw. Good work. Falcon's absence is very conspicuous. Sigh. However, I really dig his poster designed by the site. Good job! Sonic screwdrivers and cabinets are mentioned in "The Empty Child". Re #37. Wasn't it the 10th doctor who made the machine that goes ding? You have it credited to the eleveth with a photo of David Tennant. Re #38. I could have sworn the phone was Martha's and she left it on the Tardis so she could call the Doctor. Also they showed the number in "42" when Martha's mother called her because RTD mentioned in the commentary track that his boyfriend always tested phone numbers shown onscreen. We the Fans are the only ones that have ever numbered the doctors .. The creators never refer to numbered doctors .. So who really knows ! The fez may be kept by the royal family, go check the 25th anniversary serial 'silver nemesis' for a familiar item...this time on ace.